Haken will support Devin Townsend on his European Empath tour later this year. The UK outfit will play a total of 20 dates with the Canadian musician, kicking off at the Salle Pleyel in Paris on November 15 and wrapping up at Nottingham’s Rock City on December 13. Haken say in a statement: “We are beyond excited to have been invited along to support one of our all-time favourite artists, Mr Devin Townsend, on such a monumental tour. “Having just completed hugely encouraging and successful headlining tours of our own throughout North and South America and Europe, we feel truly honoured – maybe even a little electrified – to be given the opportunity to play for a whole load of new faces. “We can only hope that Devin's fans will enjoy the prescription we have ready for them!" 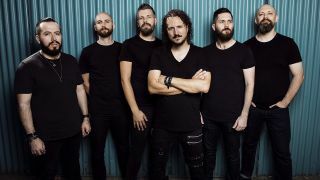 Haken will play in support of their most recent album Vector, which launched in October last year.